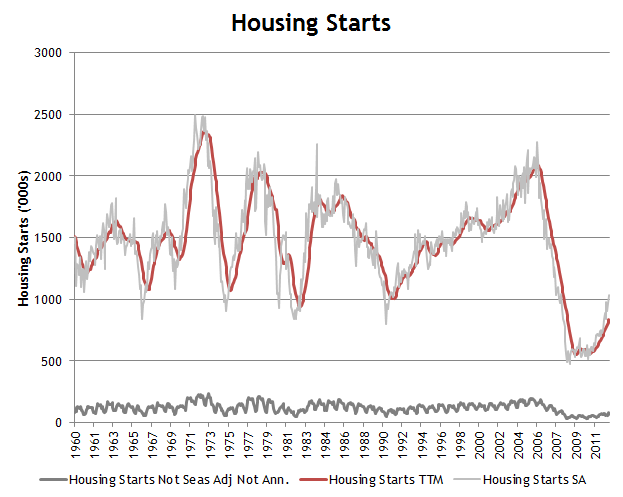 Housing starts crossed an important psychological barrier in March, making it above the million unit threshold (on a seasonally adjusted annualized basis) for the first time since June of 2008. The number is particularly encouraging in light of a smaller seasonal adjustment and lingering cold weather in many parts of the country, which could have skewed the number lower. There are 132 million housing units in the US and about 115 million households according to the US Census Bureau, which implies that one million new units would contribute to the housing stock by somewhere around 0.75% per year. Population growth has run at a little under 1% per year lately, so one million new houses is getting us much closer to a natural rate of growth and replacement for the housing market. There is still healing to be done though; the average annualized pace of new builds since 1960 is 1.5 million.